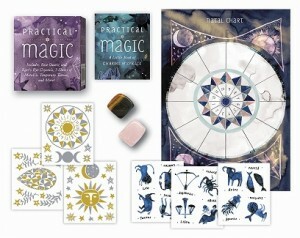 Practical Magic Review and Giveaway! Let’s be totally real here. There are hundreds, probably thousands, of beginner’s guides to magic and witchcraft. 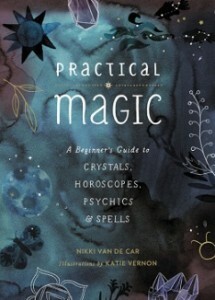 I could easily recommend a couple before ever having read “Practical Magic: A Beginner’s Guide to Crystals, Horoscopes, Psychics, and Spells” by Nikki Van De Car. However I’m here to tell you that THIS is the one you give to others (and possibly as a gift to yourself too). “Practical Magic” briefly touches on every little thing that floats in the realm of magic. 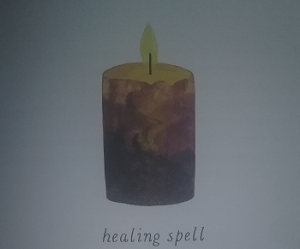 Chakras, herbs, crystals, astrology, Pagan holidays, auras, tarot, lucid dreaming, and even more are covered in this 176 page book. The author’s writing is clear and accessible. She makes every topic interesting and a thing you would want to explore more in depth. The reason this is THE gift to give is not only the broad scope, but this book is BEAUTIFUL. I mean absolutely stunning. Hard cover, heavy paper stock, full color and loaded with fabulous illustrations by Katie Vernon. The whole look of the book is magical in appearance. This photo doesn't do the art justice. Not to get all infomercial on you, but wait, there’s more! You know how stores have those irresistible little boxes with different themes at the checkout? I’m a sucker for those and there is one that goes with “Practical Magic”! This little gem is packed with goodies: a piece of rose quartz and tiger’s eye, a fill in astrological chart with adorable stickers, three sheets of temporary tattoos, and of course a tiny 48 page book to help you put it all to use! Look at all of it! But don’t leave this post yet! The great folks at Running Press gave me a “Practical Magic” book and kit to give away to one lucky Magical Buffet reader! Just do what the nice Rafflecopter below asks and you’ll be entered! Starts now, ends at 11:59pm Eastern time on Sept. 4, 2017. Open internationally, must be 18 or older to enter. Next postSpidey Saves the Day!